No matter what sort of hair problems one is facing, most of them originate from the hair follicles, the surrounding organs, hormones and general well-being stemming from nutrition, it’s assimilation and lifestyle factors. When one is off balanced due to either external or internal reasons, the body rhythm starts to tilt and hair health is where the problem occurs as a reflection of the imbalance; this may appear sooner or prolapsed. Many people have hair or scalp problems. Hair may thin or fall out, break off or grow slowly. 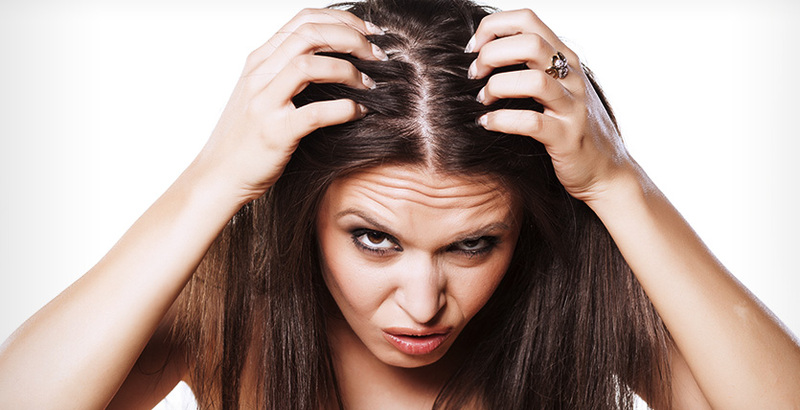 Dandruff or an itching or peeling scalp may cause embarrassment and discomfort. Hair and scalp problems can be upsetting and in many cases, lead to a bruised ego and self-esteem. That is the reason prevention, early identification and early treatment of hair/scalp problems is so overwhelmingly important. Using Quality Products is only one of the most important requisites to have healthy, strong hair. Haircare is not about using good products alone; it’s also a cause that requires continuous commitment and dedication with good nutrition and a healthy lifestyle. Hair loss, including thinning and breaking, is the most common scalp problem. Such hair are too delicate, lifeless, fragile and brittle. They lack moisture and look run-down and have a bad texture. Hair gradually thins as people age, although not all people are affected to the same degree. Hereditary thinning or balding is the most common cause of thinning hair. Women with this trait develop thinning hair, while men may become completely bald. In case of heredity, as one of the major causes, thinning may begin at any age, infact as early as early 20s. While, genes cannot be changed (genetic engineering may be working over it and it may take quite sometime to conclude the subject), good, preferably natural treatment options help prolong and delay the onset of thinning hair and baldness. Please visit the Hair Loss – Treatment Options page for analyzing the pros and cons of the prominently available options. Because of changes in hormones, women often lose hair for 1 to 6 months after childbirth or after breast-feeding is completed. Thinning hair also happens around the menopausal age. Damage to the hair from inferior hair care products, ones that are surfactant based, contain harsh chemicals like Amines, Ammonia, SLS, Propylene Glycol, Cocoamide DEA, etc, dyes and permanents, from hot rollers, curling irons or hair dryers. Hair-pulling or hair-twisting habits. Trichotillomania is a mental health problem in which a person pulls out his or her own hair, usually from the head. Side effects of medicines or medical treatments such as chemotherapy or radiation therapy. Clinical abnormality, recent surgery, high fever or emotional stress. Severe hairloss may happen anytime between 4 weeks and 3 months after severe physical or emotional stress. This type of hair loss usually stops within a few months. PCOS, lupus and/or hyperthyroidism are other causes. Poor nutrition, especially lack of protein or iron in the diet and ineffective assimilation thereof. Dandruff – a shedding of the skin on the scalp that leaves white flakes on the head, neck, and shoulders. It may be a form of a skin condition called eczema which causes increased shedding of normal scalp skin cells. Dandruff can also be caused by a fungal infection. Hormonal or seasonal changes can make dandruff worse. Ringworm – an infection of the outer layer of the scalp and in the hair. It usually causes a rash made up of circular patches with raised, red edges that resemble worms. The rash spreads from these edges, often leaving the center clear, giving it a ring shape. Ongoing (chronic) skin conditions, such as psoriasis, eczema, and seborrheac dermatitis. This is probably due to an over-production of natural scalp oil (Sebum). Irregular hair-root metabolism is what defines it. Sebum and Cholesterol build-up can clog the hair follicles leading to malnutrition of the hair root and an increased production of DHT. Like wise, excess cholesterol in the scalp can lead to an increase in the enzyme 5-alpha-reductase which is then converted to DHT. The natural herb, Saw Palmetto acts as a wonderful stabilizer of DHT concentration. Damaged hair develop pores in them and the essential moisture balance gets affected. This also happens when the hair shaft gets damaged with excessive harsh chemical treatments, perming, bonding and hair straightening. The hair fibres may also lose their shine because too little scalp oil or sebum is produced or if you are using strong surfactant (like SLS) based products. Conditioners, including Deep Conditioners and Leave-In Conditioners, not the ordinary ones but ones that specifically contain Liposomes and promote Keratin build-up are an answer to such problems. This is one of the most stubborn skin problems known to humankind. Because psoriasis is a lifelong condition, sufferers often spend years just trying to find a way to manage it. There may not be a permanent cure but only a way to manage it to get long-term relief by usage of specially formulated products over a considerable period of time. In its earlier forms, it manifests and appears as a pinkish rash accompanied with severe itchy scalp. Premature graying of hair happens when color-producing cells stop producing pigment. Gray hair is caused by the gradual reduction of melanin production over time within the affected hair follicle. The melanocytes in the hair follicles produce less and less melanin, and the result is a loss of hair fiber color strength. In most cases, it is genetic but other conditions like Vitiligo, Werner syndrome, and Alopecia Areata also cause hair to change colour. A vitamin B-12 deficiency or problems with the pituitary or thyroid gland can cause premature graying that’s reversible if the problem is corrected. The only known herb to arrest and even reverse this condition is He Shou Wu, also known as Fo Ti. The safest and most cost efficient form of hair/scalp therapies are organic/natural/herbal/botanical treatments accompanied with a stress-free regimen, healthy diet, exercise and proper hair care techniques. Finding a solution to hair/scalp problems is not always an easy task. Hair and Scalp problems deteriorate very fast but demand immense patience in reverting to a stable state. So, the sooner you start, the faster and better the results. Also, please don’t wait for any problem to erupt. Using Quality products outweighs the prohibitive costs of Treatments. Turn to the subsequent web-pages that take you through a step-by-step guide to find the real root to your hair problems, if any and the perfect solution for Total Hair and Scalp Wellness.